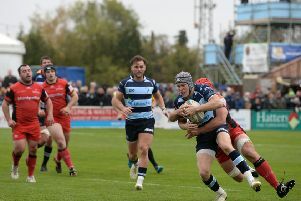 Mike Rayer is looking to include Steffan Jones in the Bedford Blues squad for this week’s home match against Doncaster Knights. Jones, who had a spell on loan at the club earlier in the season, signed for the Blues permanently this week from Newport Gwent-Dragons having also representing Wales on the international sevens circuit. Rayer said: “It’s great to have Steffan back. He offers us cover across the board, 12/13/15 as well as being a fly-half. Jones will join a squad that is picking up real momentum in recent weeks with their good performances. In their last fixture, Bedford managed to prevent Moseley from scoring a try in their 15-23 victory away from home, one that lifted them to seventh in the standings. Rayer said of that game: “I was very pleased with Saturday’s performance and result under the circumstances. We spoke about bringing the intensity we brought to the Bristol game to Moseley and away from home, on a pitch that wasn’t great in front of a small crowd, we were able to do that. “It’s a difficult place to go and get a result and we’re delighted with how the players rocked up with a good attitude. I thought defensively we were excellent to keep our first clean sheet of the season, so we are really pleased with how we applied ourselves there. Bedford now welcome Doncaster Titans to Goldington Road on Saturday, with this match being the third time they’ve played each other this season. The other two were won by the Yorkshire side in the British and Irish Cup, but they head into this fixture 11th in the table off the back of a 21-23 home defeat to Rotherham that was shown live on Sky Sports. Speaking about the match, Rayer said: ‘I’m guessing they will be pretty deflated after their narrow defeat last weekend against Rotherham, however they’ve got a real strong squad of players and they’re well coached.